gourds, originally uploaded by jahansell. Almost the first post I ever made on this blog was of my neighbor Meg's flowerbox next to her mailbox. In early spring it's always pansies or johnny-jump-ups, and she changes it every season. I happened to be walking by yesterday when she was unloading these gourds from a wheelbarrow - she explained that they grew wild in her compost heap - she had hundreds of them! Now that's a green thumb! My garden, on the other hand, yielded, and I kid you not: about four fingernail-sized carrots; one cucumber the size and shape of a tangerine; one pot's worth of sauce tomatoes; enough green beans to eat three a day from July through August; a mini-handful of edamame and... I think that's it! My leeks were about a quarter-inch thick, the other onions and scallions just disappeared, the one pumpkin that formed fell off the vine before ripening, the beefsteak style tomatoes... I have no idea what happened to them! The lettuce bolted and then was eaten by deer. Overall it was a pretty poor season - I just didn't have time (or enough sun) to pull it off. 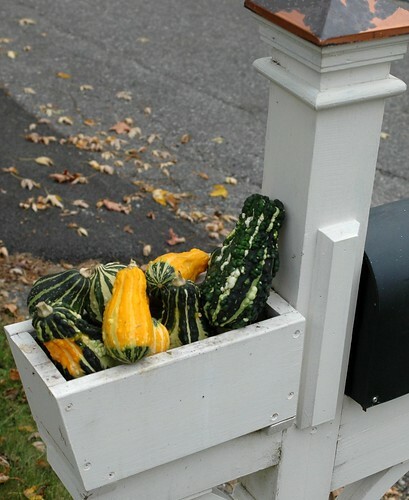 I love seeing this mailbox change with the seasons. Sorry to read your garden didn't quite make it!! There's always next year!